Scrubbies are made from nylon netting so they do not scratch most surfaces. Scrubbies are designed for scrubbing dishes, but can also be used for scrubbing hard spots on the soles of your feet. 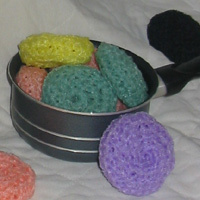 Scrubbies are approximately 3 inches in diameter and available in a wide selection of colors. You may also like kitchen cotton crochet dishcloths.